Cut up 2 cups of vegetables and place them in your food processor. Pulse until pieces are smaller than a slaw recipe. Add tahini, garlic cloves, a 1/2 inch piece of ginger root and black pepper. Keep pulsating until the texture is smooth. Measure 1/2 cup red lentils and add to 1 1/4 cup water. Allow to cook for about 20 minutes. Add some green chilies for a bite. Add a cup of cooked frozen peas for a higher protein content. Use two tablespoons to spoon small rounds on to a prepared cookie sheet (use parchment paper to lower the fat content). Treat yourself to a bit of yogurt or treat it as you would a regular burger. 280 members have added this recipe to their cookbook. If you have made any kind of burger before, it would be easy to understand that the lentils cooked in the water should be drained before adding to the food processor. Oats should be pulsed in to make it less watery. If you want more protein you could add a raw egg to the mixture, but your cholesterol in the nutrition label on the right side would not be 0 mg. I like the way she has these lentil burgers being baked in the oven instead of frying them in oil. Her serving size is 15 patties. You can see them in the photo by the little bowl of yogurt. Click on the photo to make it larger. To give you an idea of how awful this recipe is, I only signed up for this site in order to be able to post a warning to other people to never try to use this recipe! First of all, it doesn't make any sense. Ingredients are left out in the instructions, as are several key steps. Read it carefully, you'll see. You have no idea what to do with the oats, the lentils, what temperature to cook them at, etc etc etc. AWFUL. And the taste - pretty gross. These should never EVER be made. 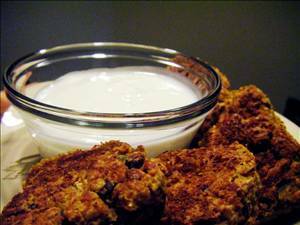 A tasty and healthy dip to serve with pumpernickel bread or veggies. Tasty dip that goes great with veggies. There are 80 calories in 1 serving of Red Lentil Veggie Burgers. Calorie break-down: 20% fat, 60% carbs, 20% protein.